Every Bromeliad we carry organized alphabetically, on one super-long page. High quality mature water-holding Neoregelias are one of our best sellers. A real customer favorite! A nice selection of high quality air plants at great prices. A beautiful addition to any terrarium. 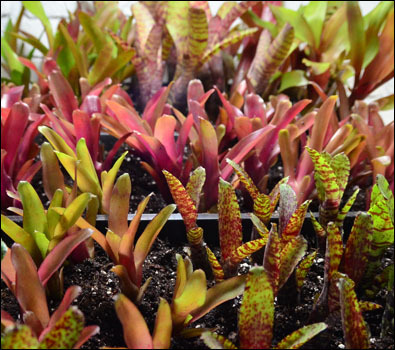 Bromeliads from other genres, plus discounted grower's choice & plant package deals. Not often available, our Neoregelia "pups" are young divisions of a mature Neoregelia, perfect for use in a live vivarium. Each plant is individually wrapped & labeled with species ID! This is our most highly discounted way to purchase healthy Neoregelias. 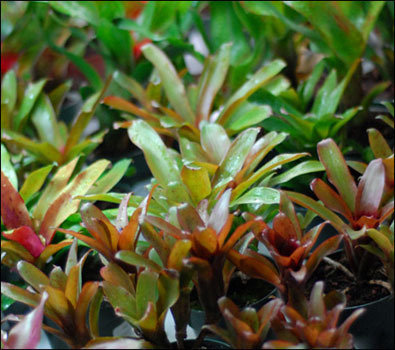 All species included are on the smaller side when mature, and are appropriate for live vivariums & terrariums. The same guarantees and quality as buying mature Neoregelias individually, only with heavily discounted pup-price. 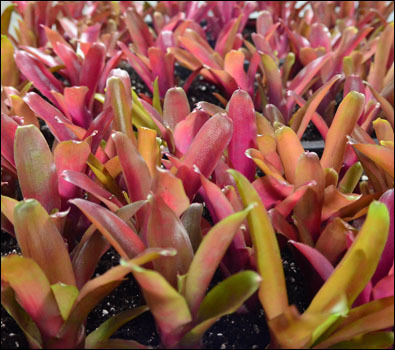 This batch of Neoregelia pups is absolutely brilliant looking - you won't be disappointed! We do our absolute best to keep repeat species to a minimum in each assortment, to ensure an awesome variety.